Mid May, two months since the last post. What have I been up to? Of course, I have been doing the regular VE sessions, but other than that… Packing. Lots of packing. We have been planning on relocating for several years now but time has finally arrived that we are moving forward pun intended. We don’t want to move in the winter and we don’t want to wait another year so… we are gearing up for a move sometime soon. One of the best ways to get ready is to start filtering through all of the stuff that has accumulated over the last 21 years we have been here. As we shed truck-loads of stuff we just don’t need to Savers and Goodwill, we have been packing up the things we can do without for a few months. Having a bunch of other stuff on the brain, the ham shack, or most of it anyway, was one of the first things to get boxed. So for now, no electronics lab. Nearly all of my test equipment is boxed up. We are up to 40 boxes, filtering and packing more every day. 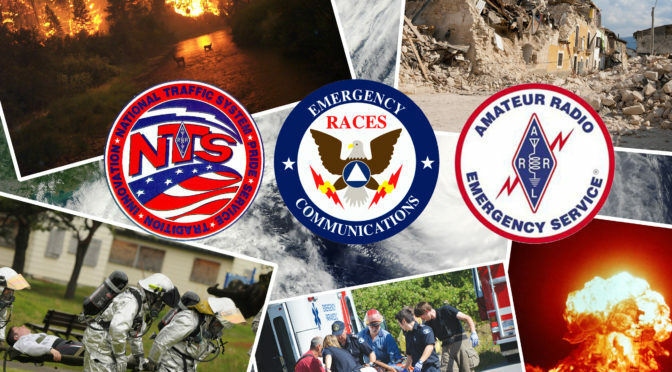 Lest you think I’m ignoring radio, I have been gearing up to be more active in ARES, RACES, NTS, Skywarn, and CERT by taking a lot of FEMA/DHS classes that are prereqs for various organizations. I am also scheduled to take a BLS class in two weeks which includes CPR, AES and more. I want to add a variety of EmComm instruction to my growing list of classes offered in the near future so I am ticking down the long list of prereqs and associated training. In a somewhat side related area, I also recently acquired my Remote Pilot certificate with Small Unmanned Aircraft Systems rating. Basically, a commercial UAV pilots license in addition to my commercial airplane pilot certificate. This will allow me to do aerial photography and inspections for pay with a UAV/UAS. And what might I be taking pictures of and inspecting, radio towers???? Possibly. Anywho, I wanted to post an update so you didn’t think I had abandon radio or the site. I just don’t have a lot to post about other than classes and ratings. 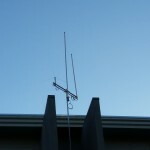 I will be doing a mobile install of my FT-817 with a quad-band antenna sometime soon so I will plan on posting about that soon. I may also be posting some short subject videos in the near future as well. Good Technician class this last weekend. Small, but a lot of fun. The best part of all was the 100% pass rate for the exam. Okay, now the confession, it was a two student class. Still, I am happy about the two newly minted hams. In recent months the chatter has been about the ham population. Two specific areas have topped the conversations. 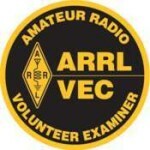 The first is centered on the retention of Volunteer Examiners and engaging the VE community. The second topic of conversation has to do with a special anniversary coming up in a few days. February 23, 2007, was the date the FCC dropped the CW (Morse code) requirements from all amateur radio licenses. Back in February 1991, the FCC dropped the code requirement for the Technician class license but it was the 2007 removal of code that made it upgrading a no-code Tech possible. There was a boost to the number of new hams in the early 90s, but the number of new hams, and upgrades, since 2007 has been record breaking. So this is all great news for hams right? Well, maybe. The truth is, there is no telling what’s going to happen. 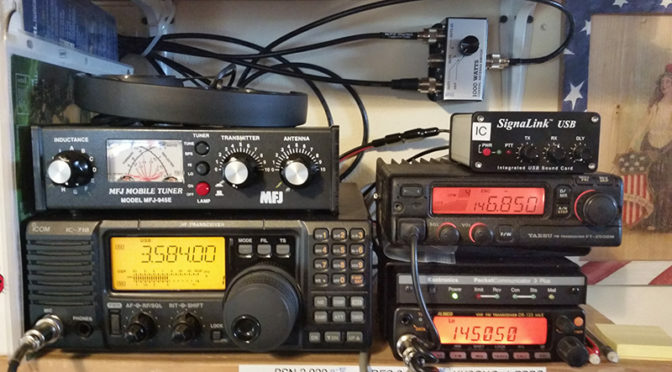 Part of what makes this an interesting subject is that we don’t know why all these new hams have been drawn to amateur radio. 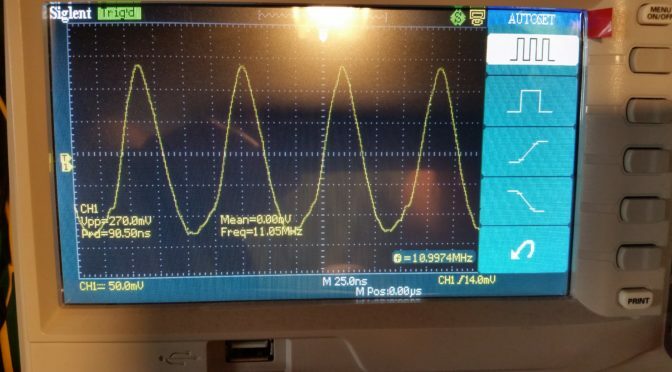 There are a number of possibilities, some centered around the huge and ever-growing population of DIYers and Makers, many of whom show interest in RF, at least on some level. There are the growing number of drone enthusiasts; some need a ham license to control the aircraft itself, others are looking for telemetry, and/or looking at RF video feeds. What does someone’s reason for becoming a ham have to do with anything? It has to do with retention. Ham licenses are valid for ten years. That’s a long time. Someone who is deeply invested in the hobby is more likely to renew their license. Someone who is involved at a more casual level is less invested and may not feel the need to renew. Here we are. It’s now ten years later and the first upgrades without a CW requirement are beginning to expire. The big question is will they renew. My hope, of course, is that the attrition rate will not grow at the same pace as the influx of new hams over the last ten years. Only time will tell. Not to put too fine a point on it, 2016 had a few issues. Too many beloved performers became silent keys, and more than a few other things that will affect us all went a bit sideways. I’m not even going to get started on politics. To start the year off on a positive note I worked a VE session in the morning January 7th and spent the rest of the day putting together a new class schedule for Technician and General classes licenses and getting started with the promotion work, posting classes and prepping presentations. I have six classes coming up, 4 Tech and 2 General January through April. All of them are 2-day weekend classes. This time around I am using the W5YI books by Gordon West instead of the ARRL books. My main motivation to switch books is Gordo’s reorganizing of the FCC questions into a more logical order. While the change will save time in class, I now have to tweak a lot of slides. There’ll be no time savings on the prep side this go, but I am optimistic that the reorg will make things a lot smoother in class. 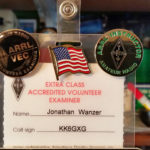 If you, or someone you know, is interested in getting their ham radio license or upgrading from Tech to General and they are local to San Jose, please pass along a link to my site. Classes are listed here. 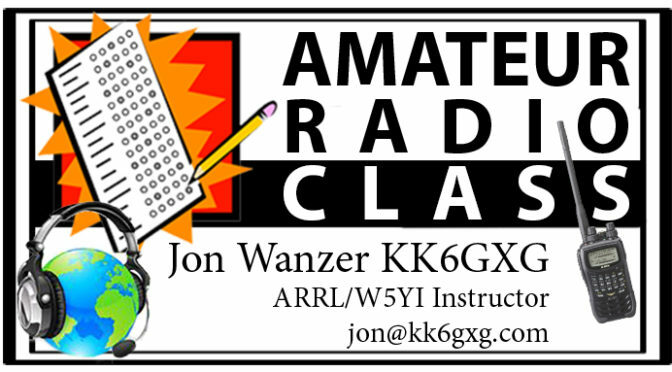 All of the classes have been posted to both the W5YI and ARRL class listings. As I write this, they are the only classes listed in the south Bay Area. 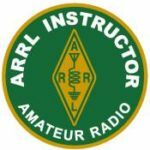 The closest classes on ARRL’s list are San Francisco and Sacramento. There are no classes listed for the area on W5YI. They won’t show up until Monday or Tuesday (2/9-10) because all class postings need to be approved by a human. I am hoping to greatly expand my teaching and hosting exam sessions later this year. All things in their time. July? Has it really been that long? Wow, yes it has in fact been that long. From a building stand point… nothing new has been going on. I am still working on the Beach 40 and the Bitx 20. The Beach 40 still needs the audio section rebuilt and the Bitx20 needs some troubleshooting . 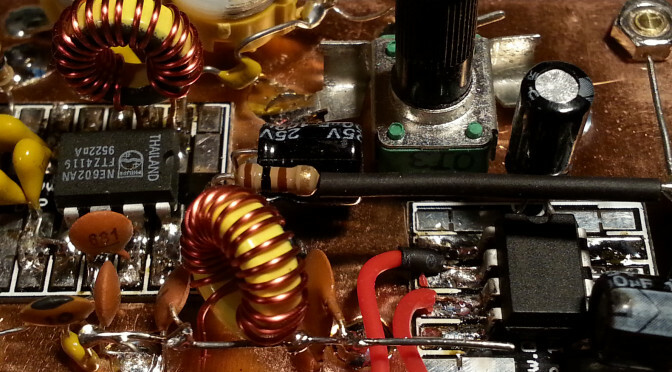 I don’t have the facilities to put up a 20 or 40 meter antenna and since both radios are QRP(p), a good antenna is vital to making any contacts. From an operators perspective… ya, nothing going on there ether. I need to pull down my Frankenstein/Hill Billy mast because we are having our building painted soon. I have plans for a simpler replacement that should work out fine. I’ll post about that if and or when that happens. From an experimenters view point… I have been kind of busy lately. 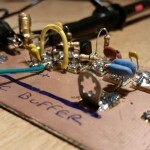 Many of the newer radio projects I have been looking at use micro-controllers and embedded Linux systems. All of which I am totally fine with. There are so many other applications besides radio that I can employ these technologies. The only impediment is getting some play time in with these technologies and getting familiar with there capabilities, use, and programming. 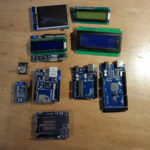 Earlier this year I picked up some Arduino hardware. I haven’t had much time to work with it yet as the Day Job has been keeping me hopping as well as a lot of stuff in the personal life, nothing bad, just a lot of changes and preparations. Many projects are done with the Arduino and various shields. Some require a little more direction in the form of an embedded system with a true OS. Enter Raspberry Pi and Raspbian. Last week I added a RPi 3B to the hardware pile and began working with it. 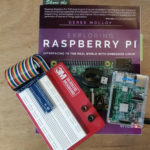 Along with the Pi I picked up a copy of Exploring Raspberry Pi: Interfacing to the real world with embedded Linux From Wiley written by Derek Molloy. Linux doesn’t worry me at all. Many moons ago I was a Solaris 7/8 admin as well as a RedHat 7 admin. The problem is that well over a decade has gone by since I actively worked on those systems. I have been in a Windows only environment for so long my Unix brain has turned to mush. So now I’m re-learning the Unix command line and re-acquainting myself with the Linux directory structure along with some all new unique elements of embedded systems and the Raspbian OS in particular. With all of the projects piling up and now adding a lot of general computer stuff to the pile, Arduino Sketches, Python, C/C++, and picking up where I left off with Perl, it almost feels like I should go back to school and get credit for all of this work. I could pick up a CS degree with everything on my “tech to learn” plate right now. Add in all of the projects and an engineering degree (EE or ME) isn’t far behind. Thoughts for another time. Radio specific plans are to read and build along with Crystal Sets to Sideband by Frank W. Harris W0IYE, and then get back to Experimental Methods in RF Design and do the same. I don’t expect to do a lot of operating other than 2 meter until we have the facilities to put up a real antenna, and there is no solid timeline for that. Life outside radio has taken all of my time lately and I am just now slowly getting back to things. Most of it is general electronics/computer experimentation and adding to the knowledge pool right now. So in conclusion, no I haven’t been busy, I’ve been too busy. P.S. Today’s post is brought to you by Hamversary. On this day in 2013 I received my license grant about a week after I walked into the Saratoga Fire Station a non-ham. 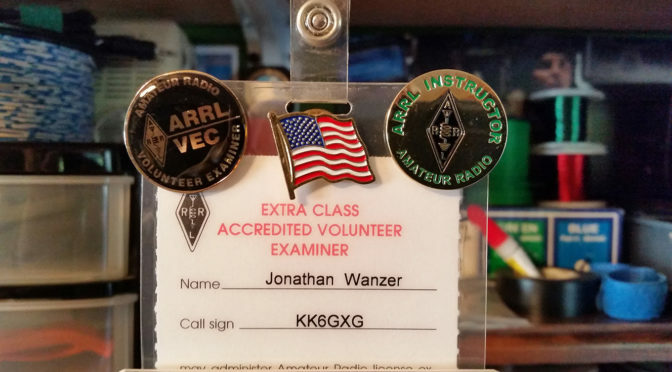 Since then I have worked my way up to Extra Class, begun teaching license preparation classes to prospective hams, and I have been a Volunteer Examiner for 42 exam sessions, most of them at the Saratoga Fire Station. I have learned so much in so many ways in this short period of time. Thank you Amateur Radio. This evening I have a new Tech class starting at 6pm on Wednesdays. I have another Tech class on Thursdays starting August 11th. I thought it was time to add a General license class into the mix as well. It starts August 23rd and meets on Tuesday evenings. All of the classes are in the evening from 6pm to 8pm and meet for six sessions on the same day of the week. I hope to be adding some other classes in the near future. Some license classes as well as some special subject classes. That’s all for now. I have some prep work to get done before class. The July 8th class went of rather well. I am happy to report that we introduced 5 new hams to the community! The class went very well and I had a few requests to add a General class to the future class schedule. I’m still working on prepping for that General class, but I do have another Technician class lined up to begin July 27th and running every Wednesday evening until August 31st. No guarantees, but I am going to try to get the General class on the books before the end of August. I have been working on the Get Your License pages today. They are finally up and functioning. There is information on how to get a license and what to expect on the exam along with links to other resources.